The shopping list application will make use of the SVProgressHUD library, a popular library created by Sam Vermette that makes it easy to display a progress indicator. You can add the library manually to your project, but I strongly recommend using CocoaPods for managing dependencies. Are you new to CocoaPods? Read this introductory tutorial to CocoaPods to get up to speed. The first line specifies the platform, iOS, and the project's deployment target, iOS 8.0. The second line is important if you're using Swift. Swift does not support static libraries, but CocoaPods does provide the option since version 0.36 to use frameworks. We then specify the dependencies for the Lists target of the project. Replace Lists with your target's name if your target is named differently. We're ready to refocus on the CloudKit framework. First, however, we need to do some housekeeping by renaming the ViewController class to the ListsViewController class. Next, open Main.storyboard, expand View Controller Scene in the Document Outline on the left, and select View Controller. Open the Identity Inspector on the right and change Class to ListsViewController. When the user opens the application, they're presented with their shopping lists. We'll display the shopping lists in a table view. Let's start by setting up the user interface. 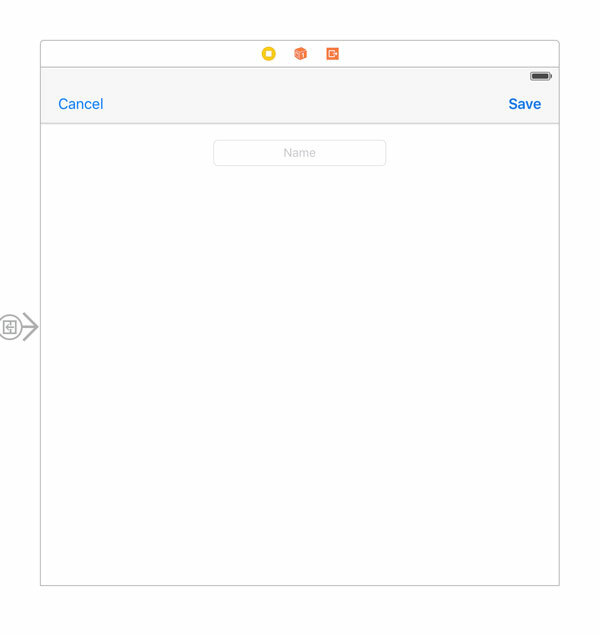 Select the Lists View Controller in the Lists View Controller Scene and choose Embed In > Navigation Controller from Xcode's Editor menu. 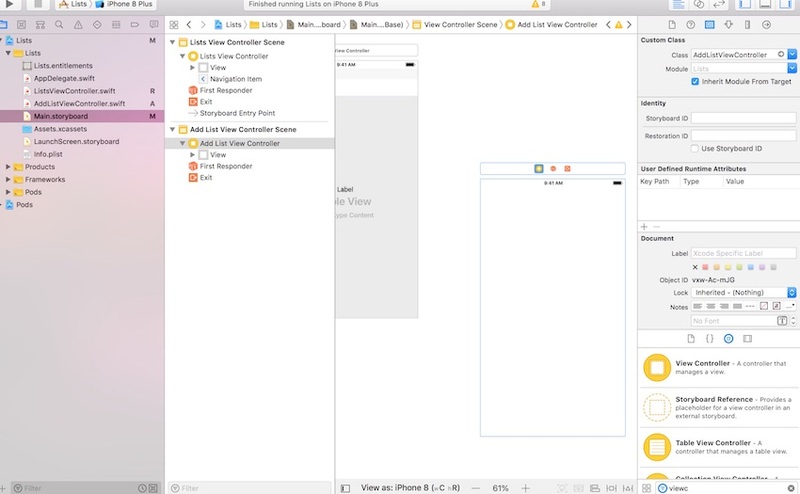 Add a table view to the view controller's view and create the necessary layout constraints for it. 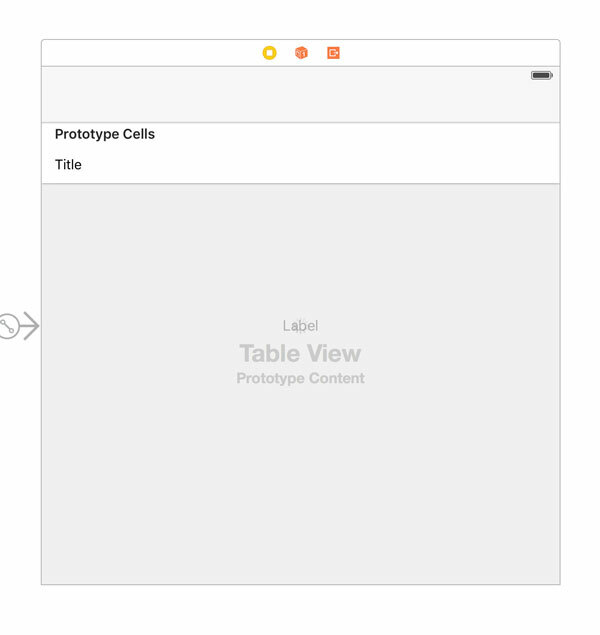 With the table view selected, open the Attributes Inspector and set Prototype Cells to 1. Select the prototype cell and set Style to Basic and Identifier to ListCell. With the table view selected, open the Connections Inspector. Connect the table view's dataSource and delegate outlets to the Lists View Controller. Even though we're only creating a sample application to illustrate how CloudKit works, I'd like to display a message if something goes wrong or if no shopping lists were found on iCloud. Add a label to the view controller, make it as large as the view controller's view, create the necessary layout constraints for it, and center the label's text. Since we're dealing with network requests, I also want to display an activity indicator view as long as the application is waiting for a response from iCloud. Add an activity indicator view to the view controller's view and center it in its parent view. In the Attributes Inspector, tick the checkbox labeled Hides When Stopped. Note that I've also added an import statement for the SVProgressHUD framework and that I've declared a static constant for the reuse identifier of the prototype cell we created in the storyboard. 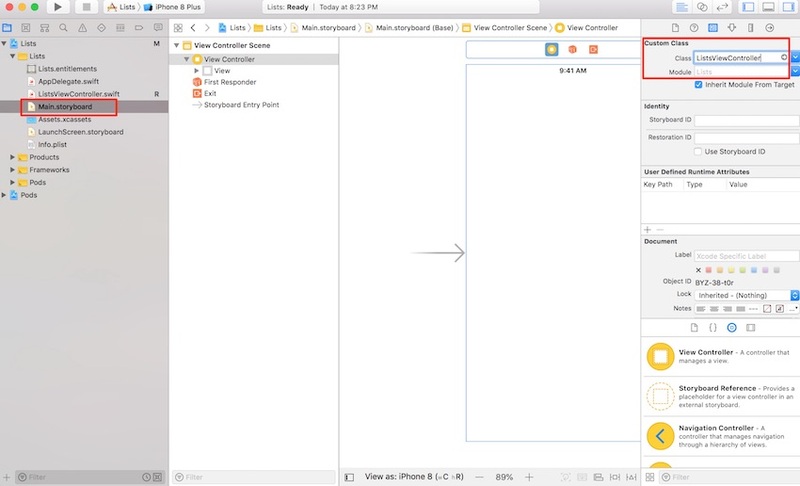 Before we fetch data from iCloud, we need to make sure the table view is ready to display the data. We first need to create a property, lists, to hold the records we're about to fetch. Remember that records are instances of the CKRecord class. This means the property that will hold the data from iCloud is of type [CKRecord], an array of CKRecord instances. If you have any experience working with table views, then the implementation of each of these methods is straightforward. However, cellForRowAtIndexPath(_:) may require some explanation. Remember that a CKRecord instance is a supercharged dictionary of key-value pairs. To access the value of a particular key, you invoke objectForKey(_:) on the CKRecord object. That's what we do in cellForRowAtIndexPath(_:). We fetch the record that corresponds to the table view row and ask it for the value for key "name". If the key-value pair doesn't exist, we display a dash to indicate the list doesn't have a name yet. There's one more step for us to take: preparing the user interface. In the view controller's viewDidLoad method, remove the fetchUserRecordID method call and invoke setupView, a helper method. 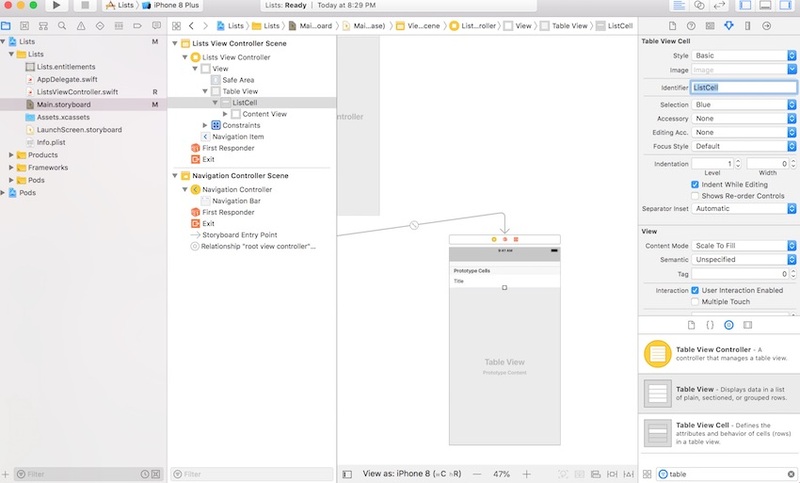 Build and run the application on a device or in the iOS Simulator. 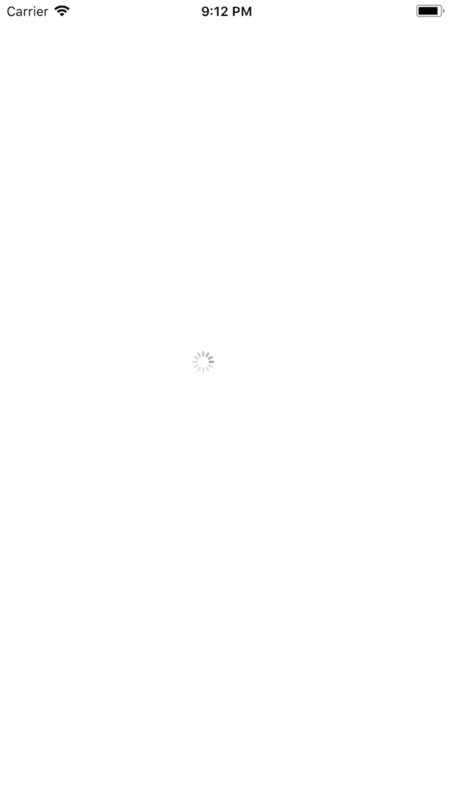 If you've followed the above steps, you should see an empty view with a spinning activity indicator view in the center. 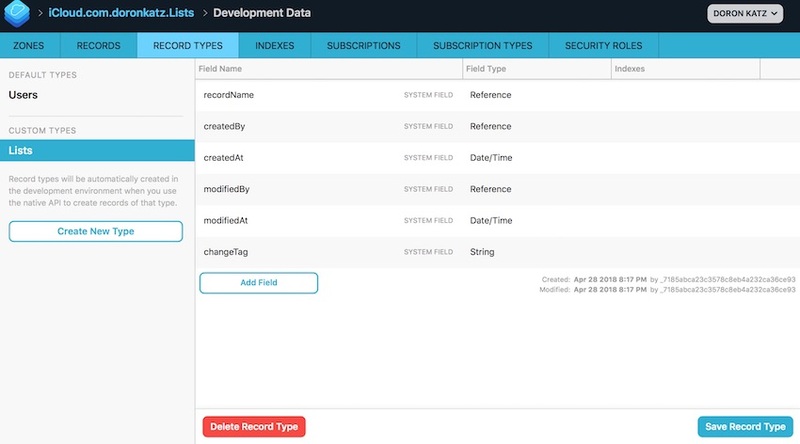 Before we fetch any records, we need to create a record type for a shopping list in the CloudKit dashboard. 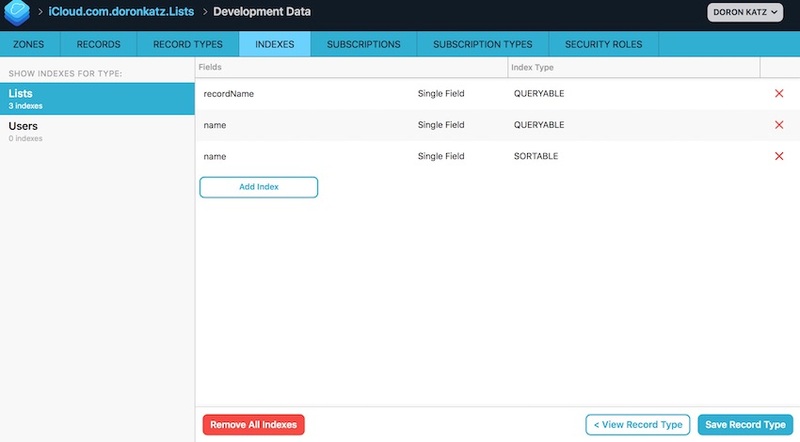 The CloudKit dashboard is a web application that lets developers manage the data stored on Apple's iCloud servers. Sign in with your developer account and make sure the Lists application is selected in the top left. On the left, select Record Types from the Schema section. Every application has by default a Users record type. To create a new record type, click the plus button at the top of the third column. We will follow Apple's naming convention and name the record type Lists, not List. Note that the first field is automatically created for you. Create a field name and set Field Type to String. Don't forget to click the Save button at the bottom to create the Lists record type. We'll revisit the CloudKit Dashboard later in this series. Finally, go to the SECURITY ROLES tab and, for the purposes of this development exercise, check all the checkboxes to ensure your user has access to the table. 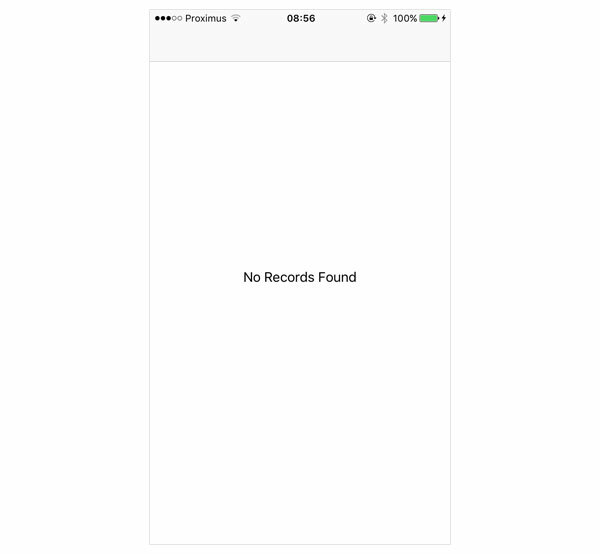 With the Lists record type created, it's finally time to fetch some records from iCloud. The CloudKit framework provides two APIs to interact with iCloud: a convenience API and an API based on the NSOperation class. We will use both APIs in this series, but we're going to keep it simple for now and use the convenience API. 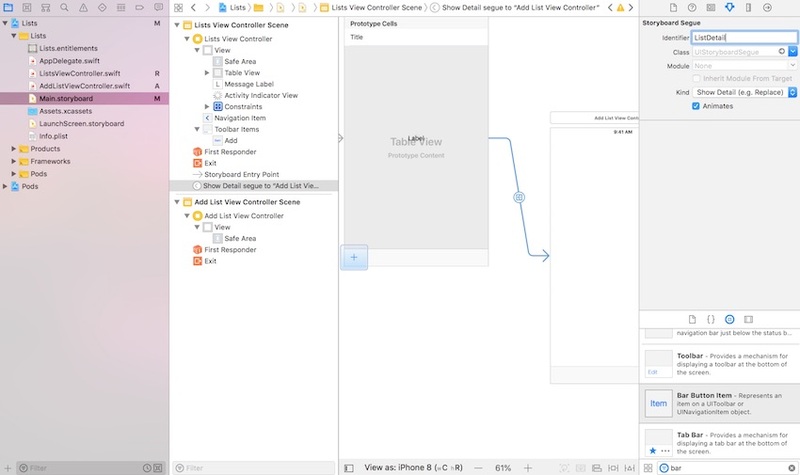 In Xcode, open ListsViewController.swift and invoke the fetchLists method in viewDidLoad. The fetchLists method is another helper method. Let's take a look at the method's implementation. Because a shopping list record is stored in the user's private database, we first get a reference to the default container's private database. To fetch the user's shopping lists, we need to perform a query on the private database, using the CKQuery class. Before we execute the query, we set the query's sortDescriptors property. We create an array containing an NSSortDescriptor object with key "name" and ascending set to true. Executing the query is as simple as calling performQuery(_:inZoneWithID:completionHandler:) on privateDatabase, passing in query as the first argument. The second parameter specifies the identifier of the record zone on which the query will be performed. By passing in nil, the query is performed on the default zone of the database, and we get an instance of each record returned from the query. Build and run the application to test what we've got so far. We currently don't have any records, but we'll fix that in the next section of this tutorial. Drag a bar button item from the Object Library to the navigation bar of the lists view controller. With the bar button item selected, open the Attributes Inspector and set System Item to Add. Press Control and drag from the bar button item to the add the list view controller and select Show Detail from the menu that appears. Add two bar button items to the navigation bar of the add list view controller, one on the left and one on the right. Set the System Item of the left bar button item to Cancel and that of the right bar button item to Save. Finally, add a text field to the add list view controller. Center the text field and set its Alignment to center in the Attributes Inspector. Before we implement the AddListViewController class, we need to declare a protocol that we'll use to communicate from the add list view controller to the lists view controller. The protocol defines two methods, one for adding and one for updating a shopping list. This is what the protocol looks like. We also need to declare three properties: one for the delegate, one for the shopping list that is created or updated, and a helper variable that indicates whether we're creating a new shopping list or editing an existing record. The implementation of the AddListViewController class is straightforward. The methods related to the view lifecycle are short and easy to understand. In viewDidLoad, we first invoke the setupView helper method. We'll implement this method in a moment. We then update the value of the newList helper variable based on the value of the list property. If list is equal to nil, then we know that we're creating a new record. In viewDidLoad, we also add the view controller as an observer for UITextFieldTextDidChangeNotification notifications. In setupView, we invoke two helper methods, updateNameTextField and updateSaveButton. In updateNameTextField, we populate the text field if list is not nil. In other words, if we're editing an existing record, then we populate the text field with the name of that record. The cancel(_:) action is as simple as it gets. We pop the top view controller from the navigation stack. The save(_:) action is more interesting. In this method, we extract the user's input from the text field and get a reference to the default container's private database. If we're adding a new shopping list, then we create a new CKRecord instance by invoking init(recordType:), passing in RecordTypeLists as the record type. We then update the name of the shopping list by setting the value of the record for the key "name". In the ListsViewController class, we still need to take care of a few things. Let's start by conforming the class to the AddListViewControllerDelegate protocol. The sortLists method is pretty basic. We call sortInPlace on the array of records, sorting the array based on the record's name. The implementation of the second method of the AddListViewControllerDelegate protocol, controller(_:didUpdateList:), looks almost identical. Because we're not adding a record, we only need to sort the array of records and reload the table view. There's no need to call updateView on the view controller since the array of records is, by definition, not empty. To edit a record, the user needs to tap the accessory button of a table view row. This means that we need to implement the tableView(_:accessoryButtonTappedForRowWithIndexPath:) method of the UITableViewDelegate protocol. Before we implement this method, declare a helper property, selection, to store the user's selection. In tableView(_:accessoryButtonTappedForRowWithIndexPath:), we store the user's selection in selection and tell the view controller to perform the segue that leads to the add list view controller. We're almost there. When the segue with identifier ListDetail is performed, we need to configure the AddListViewController instance that is pushed onto the navigation stack. We do this in prepareForSegue(_:sender:). The segue hands us a reference to the destination view controller, the AddListViewController instance. We set the delegate property, and, if a shopping list is updated, we set the view controller's list property to the selected record. The implementation of tableView(_:canEditRowAtIndexPath:) is trivial, as you can see below. The deleteRecord(_:) method should look familiar by now. We show a progress indicator and call deleteRecordWithID(_:completionHandler:) on the default container's private database. Note that we're passing in the record identifier, not the record itself. The completion handler accepts two arguments, an optional CKRecordID and an optional NSError. In the completion handler, we dismiss the progress indicator and invoke processResponseForDeleteRequest(_:recordID:error:) on the main thread. In this method, we inspect the values of recordID and error that the CloudKit API has given us, and we update message accordingly. If the delete request was successful, then we update the user interface and the array of records. That's it. It's time to properly test the application with some data. Run the application on a device or in the iOS Simulator and add a few shopping lists. You should be able to add, edit, and delete shopping lists. Even though this article is fairly long, it's good to remember that we only briefly interacted with the CloudKit API. The convenience API of the CloudKit framework is lightweight and easy to use. This tutorial, however, has also illustrated that your job as a developer isn't limited to interacting with the CloudKit API. It's important to handle errors, show the user when a request is in progress, update the user interface, and tell the user what is going on. In the next article of this series, we take a closer look at relationships by adding the ability to fill a shopping list with items. An empty shopping list isn't of much use, and it certainly isn't fun. Leave any questions you have in the comments below or reach out to me on Twitter.